Our gold and platinum collection of hand-painted sinks, lavatories and basins are all made from real metallic gold and platinum and shine beautifully. From swirls and stripes to a good selection of borders, we've taken inspiration from times old and new to create these unique designs. 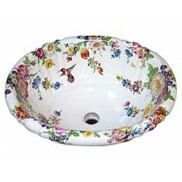 Customize your master bath, powder room or guest bath vanity with one of our decorated sinks. 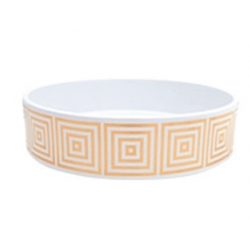 Timeless chevron design as a stripe fits well on any flat front vessel sink. Great for any style of ..
Our Swirls and Emblems work well with any color scheme and can be incorporated into a traditional or.. 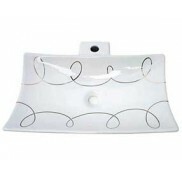 The Elegant Swirl design painted on the sink will make a very simple bathroom unique. It works&.. This is a really pretty and elegant scroll motif sourced from an historic archive that looks great o.. 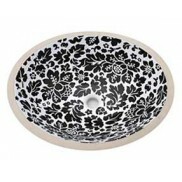 This toilet matches the Engraved Acanthus Scroll design painted vessel sink. The design has been ada..